Kizzie Jones blends her love of dachshunds and her love of the ocean to create this whimsical tall tale to delight readers of all ages. Kizzie has been published in Northwest Prime Time, Chaplaincy Today, and www.Military.com, and is a 2005 1st Place non-fiction winner for Writers on the Sound. This is Kizzie's first children's book. Kizzie and her ultimate hero, Thom, with their three dachshunds - Happy, Josie, and Molly - live happily ever after in the seaside town of Edmonds, Washington. 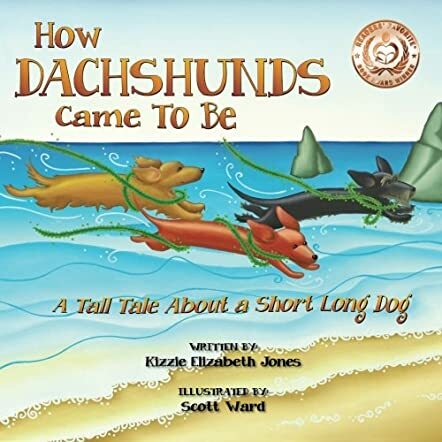 Kizzie Elizabeth Jones has a winner with the sweet children's book "How Dachshunds Came to Be: A Tall Tale About a Short Long Dog". By combining her love for the sea and her love for her own little dogs, she creates a fresh, fantastical tale full of specific, colorful details and subtly presented lessons. Scott Ward's illustrations are bright, warm and delightful, enhancing the text. For example, Jones doesn't need to explain that dachshunds come in three varieties -- smooth, long-haired, and wire-haired. The three types are shown in the illustrations. Story elements are also emphasized by the creative use of fonts, point sizes and text color. The book's main character is a little girl who loves the sea, but she is sad because her friends from the sea can't come home with her. The sea creatures love her and work together to design three perfect companions that can always be with her. In addition to teaching landlocked children about many different kinds of sea animals -- including such neglected ones as anemones, mussels and gooseneck barnacles -- the story teaches children to notice specific traits in animals and then encourages them to see how different animals have traits in common. The discussion and designing done by the sea creatures teaches cooperation, and the fact that the animals expect nothing in return teaches selfless caring. The length, gentleness and lyrical quality make this a great story to read aloud to young children at bedtime, and the well-matched illustrations will help them recreate the story when they look at the book on their own. My little grandchildren love this book with its whimsical story and adorable illustrations. I am suggesting it to dog lovers everywhere as a must, and to grandparents looking for the perfect book to read aloud to little toddlers on up to five or six year olds. My favorite description is of the petticoats sashaying on the beach as the tide comes in. My favorite illustration is the blueprint page. Such imaginations in both writer and illustrator! The little girl, the sea and its creatures, the dogs, the magic of it all! Kizzie and Scott captured it. A perfectly lovely book.